The way to get a 50 ohm communication way is different depending on your choice. I fixed tonight a problem with rfrpi and Raspberry 2+ ; it seems that wiringPi 2.25 have a bug with delayMicroseconds() function that works perfectly when less than 99us and do not work correctly with larger values. Waiting for the fix the code have been updated to work correctly with RPI2+ ; so please if you are using the shield with RPI2+, update the rfrpi code from bitbucket. You must use wiringPi >= 2.25 for RPI2+ compatibility. 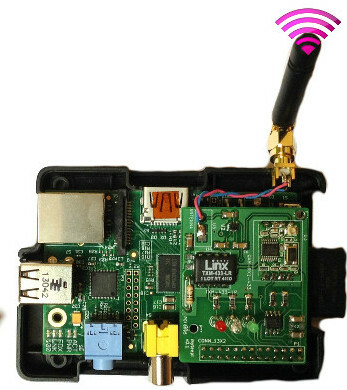 I’m proud to announced the Raspberry PI shield for high quality RF433 have just been released to be compatible with Raspberry Pi model B+ (and A+). The shield works exactly the same with the RFRPI lib. It is a little bit mode compact and modified to fit the usual cases. You can contact me for orders. 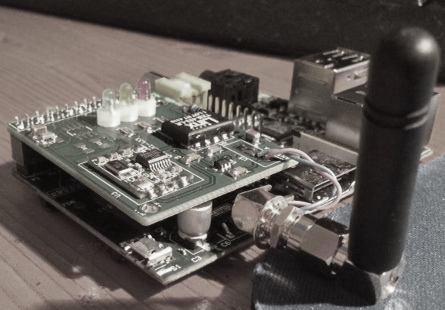 RfRpi card is a RF433 emitter and receiver add-on of Raspberry Pi. This card is based on high quality receiver and transmitter I have selected after tests you can find here and here. This article describes how to get start with this shield. The Shield is now working with Raspberry PI B+ and previous versions. The Shield is also working with Raspberry PI 2+. For these two last version you need to compile a kernel driver. 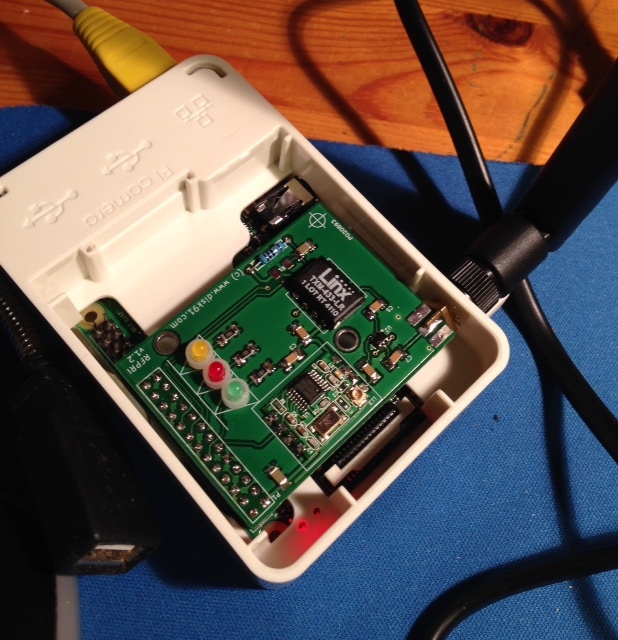 A lot of you are coming to my blog for RF433 with Raspberry PI content (here). This article is a small part of a larger project I have. 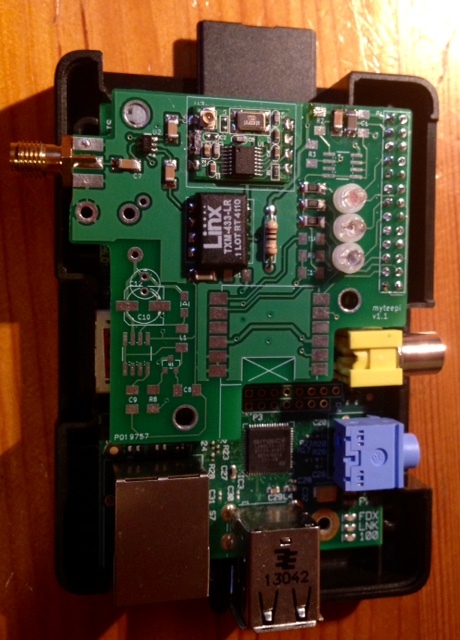 As part of this project I built a Raspberry Pi shield including an RF433 emitter and receiver. I could sell this shield to some of view if it make interest to you. To make it I selected emitters and receivers to get the best quality / price compromise. (read my other articles on this topic) I could sell it around 60€ + port. Update : chek this article for all informations on the shield and buy it ! My question to you is : would you be interested in a such thing ? Here is the Version 1.0 with antenna connector integrated to PCB. After having test some receiver, naturally, I’ve tested some transmitters, the objective is the same : get the best coverage in the same condition : I would say poor conditions. Lots of wires going every where and an antenna make with a simple 17.3cm wire. As expected, results vary regarding the emitter used. Reed more to get details.